Posted on 25, March 2019 by EuropaWire PR Editors | This entry was posted in Agriculture, Economy, Education, Energy, Gas & Oil, Environment, Italy, News, Science, Technology and tagged agricultural research, agriculture, Arctic cryosphere, Barbara Lezzi, Basilicata, bio-refinerie, bioeconomy, biofuels, circular economy, Claudio Descalzi, climate change, CNR, decarbonization, drought, Eni, fusion energy, Giuseppe Conte, lower CO2 emissions, Massimo Inguscio, Metaponto, Michele Emiliano, Portici, power plants, RESEARCH, superconducting magnets, UN's 2030 Agenda, water cycle, water systems. Bookmark the permalink. 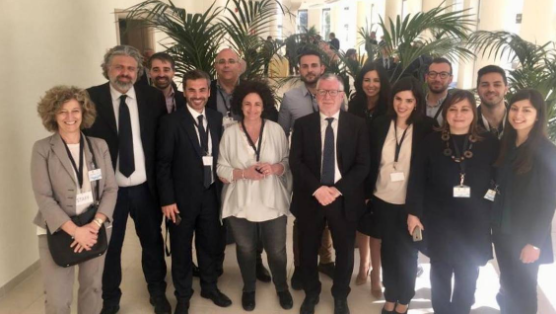 LECCE, 25-Mar-2019 — /EuropaWire/ — The Italian National Research Council (CNR) (The Consiglio Nazionale delle Ricerche) and Eni have just signed a Joint Research Agreement (JRA) with the aim at setting up four linked research centres in southern Italy. The research centres will focus on four key fields, all related to the decarbonization of the energy sector, sustainable growth, promoting the circular economy and bioeconomy, innovative and sustainable water systems and agricultural techniques while promoting sustainable environmental and economic development in Italy and the wider world. The agreement was signed by Massimo Inguscio, President of the Italian National Research Council (CNR) and Eni CEO Claudio Descalzi while the ceremony was attended by Prime Minister Giuseppe Conte, Minister for Southern Italy Barbara Lezzi and the President of the Apulia Region, Michele Emiliano. The planned four centers will be based in Lecce, Gela, Basilicata and Portici and will all have laboratories dedicated to the research in the following fields arctic climate change, magnetic confinement for the creation of clean fusion energy, sustainable and innovative management of the water cycle and agricultural methods with lower CO2 emissions. Eni and CNR will jointly agree on and define the objectives, activities and resources for the four research centers. Eni has nine active strategic agreements with some of Italy’s top universities and research bodies having committed more than 67 million euros. Analysing and quantifying climate processes linked to the destabilisation of the Arctic cryosphere, in particular the permafrost and the effects of it melting into the Arctic Ocean is what the Eni-CNR laboratory at the CNR Nanotec Institute in Lecce is focused on in its research work. These processes are found to be of great significance as they could increase the current rate of global warming and reduce environmental quality. Eni and CNR have indeed created the first Italian laboratory for the integrated study of the Arctic cryosphere that will take measurements in the field, make satellite observations and use numerical modelling as well. In Gela, The Ettore Maiorana Eni-CNR centre for fusion energy will conduct cutting-edge research on the properties of plasma, superconducting magnets and power plants that exploit the material properties and advantages of fusion. It will include work on methods for transporting and storing electric power partnering with other CNR centres already working in Sicily in these fields. The Eni-CNR joint project will leverage Eni’s expertise at the CNR research centres of excellence to develop technological skills and knowledge of innovative techniques and validation methods for fusion energy. The Acqua Eni-CNR centre in Metaponto, Matera, Basilicata, will focus on the development of scientific knowledge and will be promoting innovative solutions and technologies for using water more productively and efficiently in agriculture. The project will also be working on mitigating the growing impact of drought in the Mediterranean and other strategic areas like the Horn of Africa, the Sahel and the Middle East. CNR’s agricultural research in Portici will be working on promoting the circular economy. They will conduct studies on decarbonization efforts in the agricultural industry, as well as how biomass waste can be used as a raw material for producing biofuels in Eni’s bio-refineries. Increasing the development of sustainable agriculture that uses land for a variety of purposes and involves planting a wider range of crops will also be within the scope of CNR’s agricultural research in Portici. This research work and methods will support the bioeconomy in keeping with the UN’s Sustainable Development Goals and EU research programmes on the bioeconomy and agrifood.